A new 16,000 square foot general-purpose chemistry facility will be built at Pacific Northwest National Laboratory. Expected to open in 2016, the facility's 10 laboratories will support a variety of Department of Energy missions. 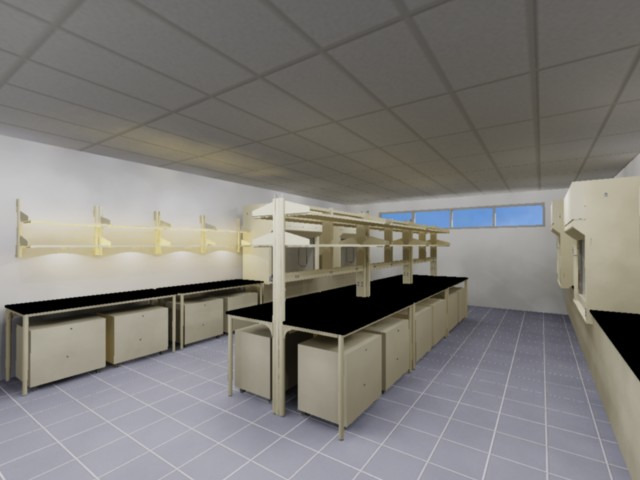 This rendering shows a modular laboratory space in the new general purpose chemistry facility to be built at Pacific Northwest National Laboratory. Modular laboratories will allow for flexibility to conduct experiments in support of many different Department of Energy research missions. RICHLAND, Wash. — A contract was awarded to DGR*Grant Construction of Richland today to build a new chemistry laboratory building at the Department of Energy's Pacific Northwest National Laboratory. Construction is set to begin this spring on the general-purpose chemistry building. The facility was identified as the number one research space need at PNNL. It will support a broad range of research missions at PNNL and includes features to make the building easier to modify for specific projects. At approximately 16,000 square feet, the single-story building will cost about $7.5 million to build and furnish. It will feature 10 chemistry labs and a small complement of workstations for researchers to use while conducting their experiments. It will be located on the north end of PNNL's core campus in Richland near the corner of Stevens Drive and Horn Rapids Road, adjacent to the nearly complete Systems Engineering Laboratory. "PNNL looks strategically at a number of factors to develop and maintain the campus, with our science vision and customer needs as the top drivers when it comes to our facility planning," said PNNL Director Mike Kluse. These modern chemistry laboratories are necessary to support multiple DOE programs involving molecular science, catalysis, materials, genomics and biogeochemistry research. Initially, research in the new building will focus on energy storage, which includes development of batteries for electric vehicles and very large stationary batteries to support the electric power grid. "We had the opportunity to work with PNNL's in-house architects and engineers who designed the building to fit the most common and critical needs of our research projects," said Vince Sprenkle, technical group manager for much of the Lab's energy storage work. "In addition to providing much needed lab space, the design and modular nature of the labs enable more work in less space and lets us rapidly reconfigure as projects and needs change." "DOE has been working closely with PNNL in the past few years to develop a comprehensive facilities strategic plan," said Roger Snyder manager of the Pacific Northwest Site Office, which oversees PNNL for DOE. "This planning ensures that the laboratories and support buildings are in place for current and future missions of the Laboratory." The facility meets the Federal Leadership in High Performance and Sustainable Building guidelines, which help reduce the total ownership cost of facilities, improve energy efficiency and water conservation, and provide safe, healthy, and productive environments for staff. For instance, the new building will leverage excess chilled water capacity from the nearby Physical Sciences Facility to cool equipment and provide air conditioning. The laboratory building is expected to be completed in spring 2016. The new facility is part of an ongoing campus strategy to acquire, modernize and sustain facilities and infrastructure to further enable core research and development capabilities at PNNL.